The Report from Iron Mountain is a book published in 1967 (during the Johnson Administration) by Dial Press which puts itself forth as the report of a government panel. The book includes the claim it was authored by a Special Study Group of fifteen men whose identities were to remain secret and that it was not intended to be made public. It details the analyses of a government panel which concludes that war, or a credible substitute for war, is necessary if governments are to maintain power. The book was a New York Times bestseller and has been translated into fifteen languages. Controversy still swirls over whether the book was a satiric hoax about think-tank logic and writing style or the product of a secret government panel. The document is a favorite among conspiracy theorists, who reject the statement made in 1972 by satirist Leonard Lewin that the book was a spoof and that he was its author. 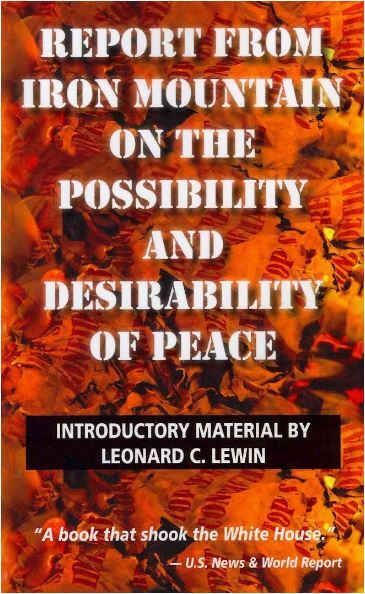 The heavily footnoted report concluded that peace was not in the interest of a stable society, that even if lasting peace "could be achieved, it would almost certainly not be in the best interests of society to achieve it." War was a part of the economy. Therefore, it was necessary to conceive a state of war for a stable economy. The government, the group theorized, would not exist without war, and nation states existed in order to wage war. War served the vital function of diverting collective aggression. They recommended "credible substitutes" and paying a "blood price" to emulate the economic functions of war. Prospective government-devised alternatives to war included reports of alien life-forms, the reintroduction of a "euphemized form" of slavery "consistent with modern technology and political processes", and - one deemed particularly promising in gaining the attention of the malleable masses - the threat of "gross pollution of the environment". Editor's Note: I find the suggestions within this book to fall inline with the actions which have been carried out by our own government (CIA) and are being enforced by the United Nations and followed by the member countries in the name of peace. Noteable was for this groups first reccomendation to be first and formost the “total” and general disarmament for “peace” and then the use of the Rand Corporations Delphi Technique/Mind Control. No wonder they wanted to remain secret!